What I’m Reading: I finished Jamie Blair’s Leap of Faith and absolutely adored it. My only (tiny) complaint is that I wanted more from the ending. Not a different ending — just more. I fell so in love with the characters and I was left feeling a little uncertain about their futures. Maybe Jamie Blair will write a sequel? That would be awesome! Now I’m reading Lucy Christopher’s The Killing Woods. Her Stolen: A Letter to My Captor is one of my favorite YAs ever, so I’ve got super high expectations. So far I’m intrigued and I like the dual POVs a lot. It took me a little while to warm up to the story itself because there are so many unknowns, but so far so good! What I’m Writing: Incase you missed it, I’m cohosting a #WriterRecharge with Alison Miller, Liz Parker, Elodie Nowodazkij, & Sara Biren. We’re setting goals for the month of February, posting them, writing/revising together on Twitter, and holding each other accountable. It’s an awesome way to stay motivated and up productivity, plus it’s just fun! If you’d like to sign up, you can do so at Sara’s blog. My main goal for February is to have a readable draft ready for my CPs by the month’s end. It’s a big goal, but one I *think* is doable. Thanks to #WriterRecharge, I’ve been revising A LOT. It’s crazy how knowing that people will be checking in on my progress motivates me. Whatever it takes, right? I’m about halfway through this major first revision and I’m feeling pretty good about it. Thanks to some help from one of my CPs (you’re the best, Alison!) I’ve got one of my big issues worked out. Now I’m mostly trimming all the fat so I can make room for the awesome new bits I know I need to add. What Else I’ve Been Up To: Cheering on the Seahawks to a Super Bowl championship, of course. Like most Pacific Northwesterners, we are beyond excited about Sunday’s victory! I took a break from running over the last several weeks, but now I’m back at it. My endurance has suffered (last spring I could run five miles in under forty minutes), but I’m not too discouraged. I’m taking it slow and building up my stamina, and even though my neighborhood is ridiculously hilly, I’m enjoying it. That pic of your daughter is really adorable! And I need to read the new Lucy Christopher’s book 🙂 Can’t wait to hear your thoughts! So far I’m really liking it, Elodie. It’s definitely different, and I’m very curious to see how it all plays out in the end. Thank you for your kind words about my story. I *hope* I’m doing these characters justice. Have a wonderful week, friend! Thanks, lady! #WrterRecharge has be all kinds of motivated! LEAP OF FAITH is on my TBR list for sure, so glad you liked it! Good luck with your Writer Recharge goals! Hopefully you can knock out these revisions this month! 🙂 Have a great week, Katy! Totally agree about T-Swift’s songwriting in “All Too Well.” Such gorgeous lyrics. And LEAP OF FAITH is awesome. It’s one of those books that made me physically tense and nervous, with a very sweet love interest. Big recommend, and big thanks to Tracey Neithercott for recommending it to me! That TSwift song is actually on the playlist of my current WIP 🙂 So are a few of her other songs – nobody sings beautiful teen angst quite like her. Good luck with revising this week! I’ve got T-Swift songs all over my WiP playlists too. One of her songs actually saved one of my stories thanks to a big lightbulb moment while listening. 🙂 Hope you have a great week too, Jennifer! 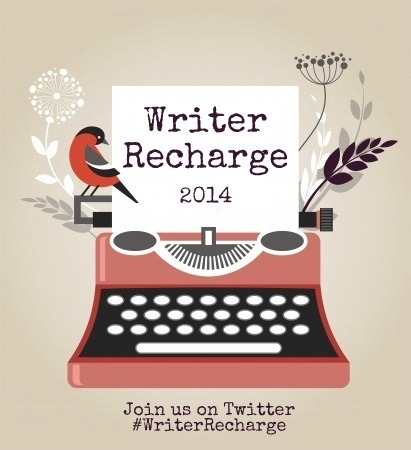 Writer Recharge is just the ticket for February! I might have to jump on board! And congrats on getting your run on! I am a terrible jogger. I need to up my game. I don’t care for indoor running either, Jolene. Funny how the continental US is getting hammered by winter, but Alaska… Not so much. 🙂 Hope you keep up your writing momentum! Writer Recharge sounds like an awesome challenge. Good luck, and have fun! I love most of Taylor Swift’s songs. Thanks for starting the Writer Recharge, I need the motivation! Glad you’re joining us, Steph! awesome job on all the revising! I requested Stolen from the library and can’t wait to dive in. Glad to hear you loved it so much! Oh, it’s so good, Prerna! Totally blew my mind. Let me know what you think! All the best with the Writer Recharge. Knowing that others are cheering you on and taking an interest in your progress certainly is motivating. Have a great week! I love that Taylor Swift song. I actually got a bit teary eyed at her concert when she sang it because she put so much emotion into it. Ah, Stolen- it killed me. She’s a fantastic live performer. Also, STOLEN totally blew my mind. I think it gave me a case of Stockholm Syndrome. So intense! Yay for the Seahawks, and for accountability. Good luck with your goal of finishing your revision by the end of the month. Thanks so much, Kate! Have a fantastic countdown-to-debut week! I had a couple of sad Broncos fans on my hands Sunday, but congrats on your team winning. Best of luck with your running and revisions this week! Big bummer for the Broncos fans. But yeah… Us Pacific Northwesterners are pretty excited! Have a great week, Erin! Good luck with your writing goals. The only writing goal I can think of for February is to have my WIP well into 1944 by the end of the month. I think it’ll help that there’s going to be about a year gap between June 1943 and D-Day, to avoid filler material for the mere sake of filler. Sounds like you’re making great progress, I’m excited about WriterRecharge, there is definitely something about checking in that works for me. Ditto to everything you said about LEAP OF FAITH. I can’t wait to hear your thoughts on THE KILLING WOODS. STOLEN is one of my all-time favorites, so I have high expectations for that. And high-five for tons of revising. Speaking of… I think I need to tweet you to join me in Revisionland tonight. I will email you when I’m done with THE KILLING WOODS, Trace. It’s very dark and intense and I like it, but I’m still not sure how it’s all going to wrap up. Interesting… And yay for an evening of revising. I so need it! I’m planning to jump on the Writers Recharge boat 🙂 It sounds great. I wish i had seen it sooner. Have a great week. We’re just starting this week, Angel, so you haven’t’ missed anything. So happy you’re joining us! Yay! Happy 6 and 1/2 b-day to C! And glad I could help! I can’t wait to read the WHOLE THING! Just as I was receiving email notification of this comment, I was sending you a response email. Great minds. 🙂 And thank you again for your help! Aww, happy half birthday to your little lady! She’s adorable. I still haven’t read any of Lucy Christopher’s books, but I really want to! It sounds like she’s a fantastic writer. As you already know, I love “All Too Well” to death. I’ve listened to it an alarming number of times in the past couple of weeks lol. I feel like every Taylor Swift song is an amazing YA contemporary waiting to happen. I think it’s fantastic that you celebrate C’s half birthday. What a fun idea! Like you say, that’s such a huge deal in their young lives, so why not have a little fun with it? Hope you’re having a wonderful week writing-wise and otherwise, Katy!